Parker’s suffers in silence with anxiety and nightmares due to his dark past. After serving in the army for nearly eight years, he came back to Prospect to start anew. Though he never quite got over Aubree bailing on him the moment she turned eighteen, it seemed so easy picking up where they left off. The past can be forgiven, but the future stands in the balance. She’s only in town for a week and then she’s going to do the very thing she did ten years ago, unless Parker can find some way to convince her to stay. 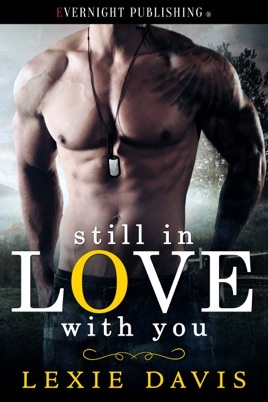 STILL IN LOVE WITH YOU is second chance at love, one of my favorites genres. It is charming, sweet and light and although there are some emotional issues discussed, it never weighs the story down. Parker Montgomery and Aubree Manning meet again after ten year and realize they still have strong feelings for each other. Parker and Aubree were high school sweethearts but broke up when Aubree left town. After Aubree left, Parker joined the military and now he is the town sheriff. Unfortunately, the four terms Parker served overseas, took its toll on him and he still suffers from PTSD. Aubree left Prospect, Texas ten years ago and is now a successful financial adviser living in Dallas. She is tough and outspoken and her mouth usually gets her trouble. It is funny how she unintentionally starts rumors about herself. Everyone in this small town is meddling and trying to get Parker and Aubree back together, except Parker's current girlfriend. Can Parker and Aubree overcome all the obstacles keeping them apart? They each have insecurities and issues yet, when they are together, they are stronger and bring out the best in each other. I liked this sweet and funny story but I have it admit, there were times the story did not seem believable or realistic. As an example, I found it hard to believe Parker, an alpha male, did not mind when Aubree buys him all new appliances for his house, without first asking him. At times, this story is silly and there is plenty of gossip going on with all the busybodies in small town Prospect, Texas.